Jeru the Damaja, Pete Rock & CL Smooth, 3582, Big L, Memph Bleek + Beanie Sigel and more. 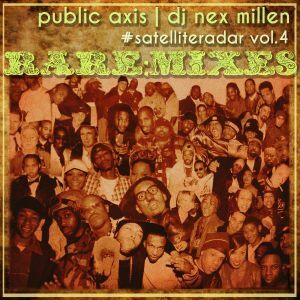 THE HIPHOP RUSH-HOUR MIX SHOW: REINVENTED.. DJ NEX MILLEN, once again, skillfully taps the Public Axis vinyl collection to mix obscure gems in veteran party-rocker fashion.. All tracks couple familiar faces w/ unfamiliar backdrops c/o Four Tet, Cloudkickers, 9th Wonder and more from vinyl-only releases.. The records were purchased from shops everywhere b/w Boulder and Berlin (literally). The remixes are rap treasures as rare as (for example) legendary LA emcee, Kurupt, posing for a flick w/ Dionne Warwick, (who, young heads, was considered a lead conspirator in an attempt to ban early-90&apos;s West Coast "gangster rap". FAIL, btw).. Or as rare as Jah Rule chilling w/ Martha Stewart (we hope), a young Jadakiss w/ Leo DiCaprio- clad in his best Tiger Woods apparel, or Nas in a tuxedo... Whether referring to Dom&apos;s handmade-collage cover art, or the all-around hip-hop excellence in this NXM masterpiece, we&apos;re proud to host a collection of momentous occasions that may never be witnessed again.